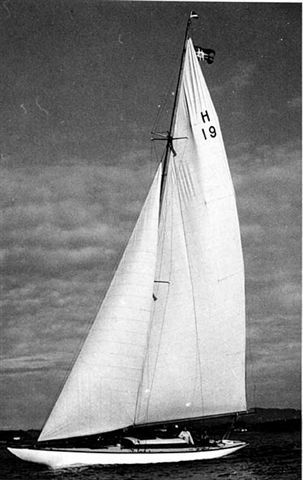 "SNARKEN" & ODD ÖSTLUND & "LUCIE IV"
rig, mast and sails from 8mR(old) H19 “Lucie IV”, Johan Anker 1912. 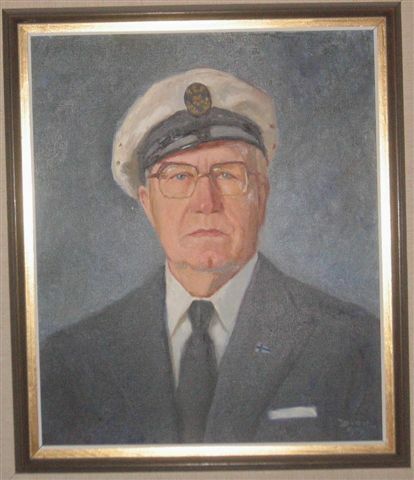 In summer 1959 Odd Östlund acquired "Snarken" which he during his work as DnV surveyor with office in Kragerö, on the South coast of Norway, found standing onshore in a shed on Askerøya. 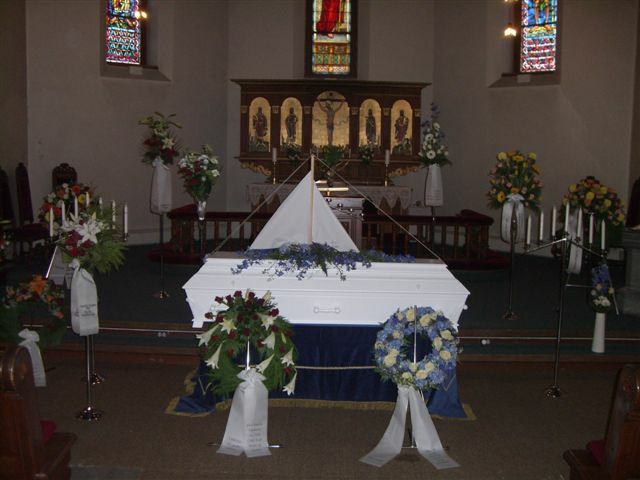 Her last prior name was "Elcoma" and owner Marcussen. Odd Östlund renamed her "Snarken" (The Snark) as he found "Elcoma" to spectacular, and "Snarken" was the other name she had carried most her time in the 1930-ties. 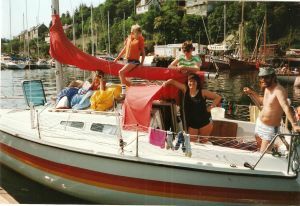 My fathers main reason for acquiring "Snarken" was her cabin top which made her lot more cruising friendly for a growing family of four. 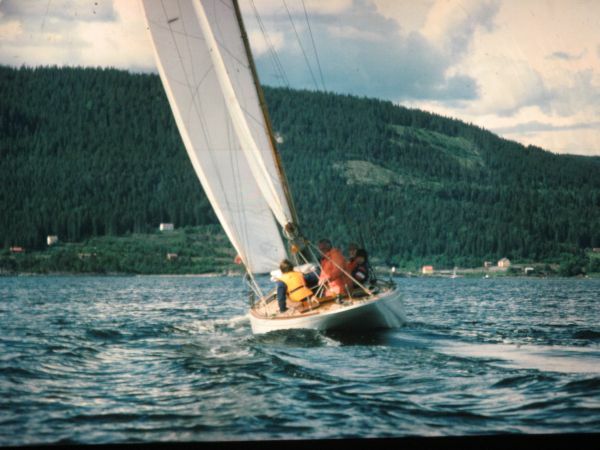 I myself was 12 years old when my father acquired "Snarken"and although I had done my first time as yachtsman 3 months old onboard the family's elder 8mR(old) H19 "Lucie IV" (without cabin top), I had great pleasure in growing up on "Snarken". "Snarken" Hs38. Yacht 223 Anker & Jensen. 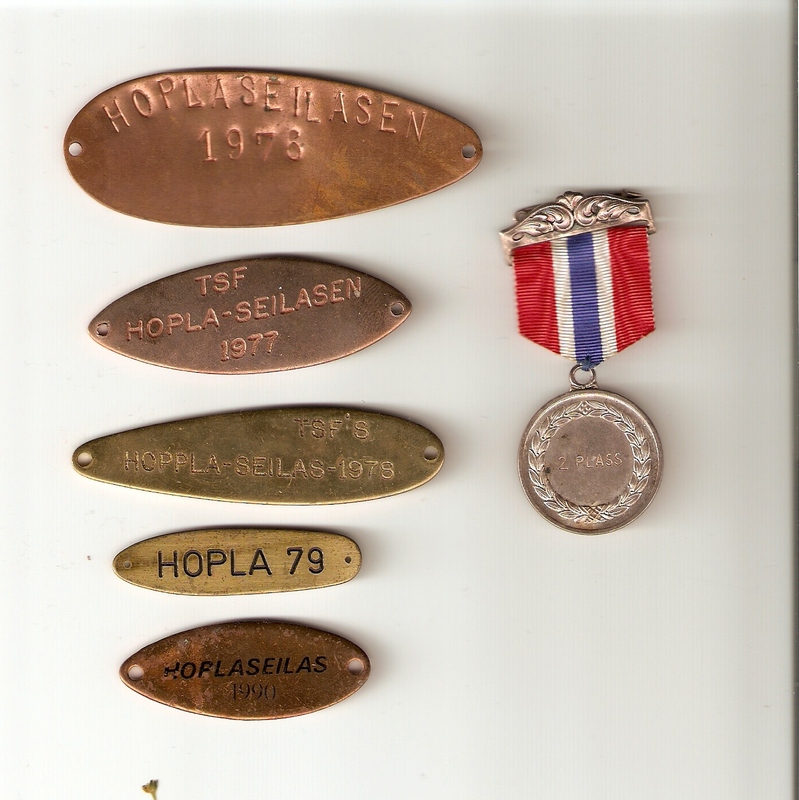 Purchased with dinghy and sail July 1959 for Nok 9.500. Put onshore Kittelsen yard (Risør) in August for total repair. Agreed with Kittelsen 19/11-59 that cost is not to exceed Nok 8.000 and if less actual cost to be paid. The new interior to be airy for easy maintenance as on "Lucie IV". 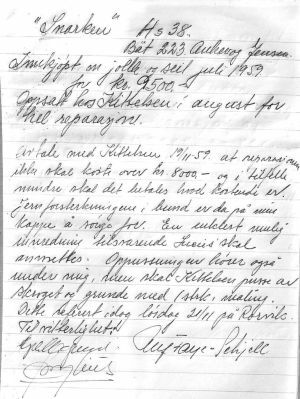 Minutes of Nov. 21.1959, witnessed by Egil Midtgaard, Ulf Faye-Schjöll and Öyvind Mylius. ", unquote. 8mR (old) “Lucie IV” was designed by Johan Anker and constructed at Langesund yard in1912. She was selected to represent Norway in the Olympic games in Stockholm in 1912 together with 8mR (old) “Taifun”, Anker & Jensen 1911. The Olympic races took place in Nynäshamn outside Stockholm. For some reason “Lucie IV” did not start although she was present during the games. 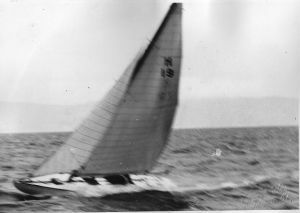 "Lucie IV" beat "Taifun" in the 8mR Class in the European Race Week 1914. H 19 “Lucie IV",ex“Magel”, ex“Lucie IV”, owner Jystad & Östlund, Trondheim, H 20 “Sarina”, owner Bernhard Wessel, Bergen. 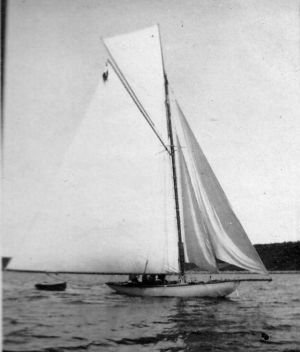 The first S-Eight given sail no sH20 "Borgila" GKSS was acquired by shipowner Haraldson in Norway and given sail no sH 32 named "Sif". 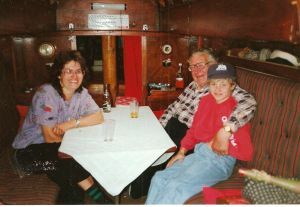 Bernhard Wessel sailed in the late 1920-ties “Sarina” north from Bergen to Trondheim where she remained until she was sold to Stockholm, Sweden in the 1960ties. Her faith in Stockholm is unknown? “Lucie IV” remained in the Östlund family, she was handed ower from late Ole Östlund to his son Odd Östlund. 8mR (1912) "Lucie IV" had under the ownership of Ole and Odd Östlund been upgraded with the Development in the International R-rule. 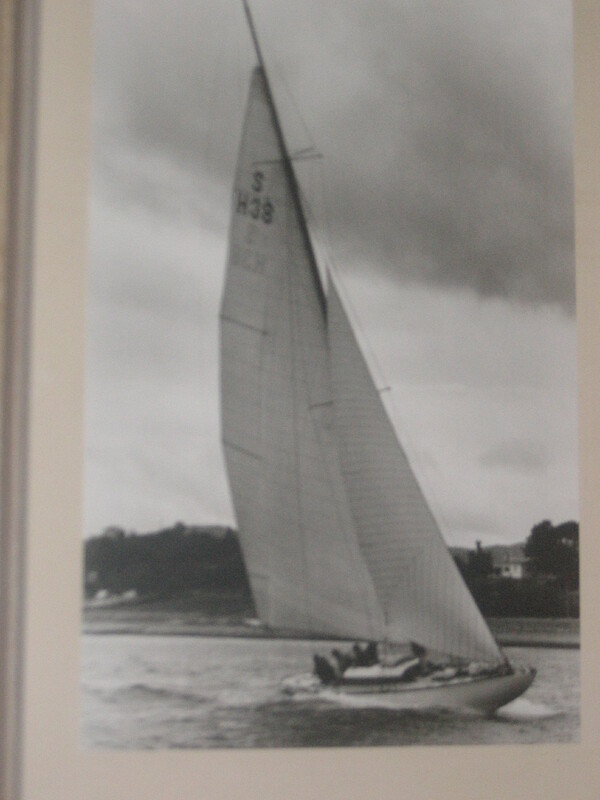 8mR "Lucie IV" (Anker 1912) With her New mast (design Estlander 1930?) in 1931 (2nd R-rule was in 1928 ammended With max height of main sail 2xR+1 above deck). The same fall she was put onshore, dismantled, her lead keel chopped up and sold and all equipment, rig, mast and sails made available for 8m “Snarken”. The old sails on "Snarken" ("Elcoma") was in less good condition compared to the present sails on "Lucie IV" and the mast was shorter. 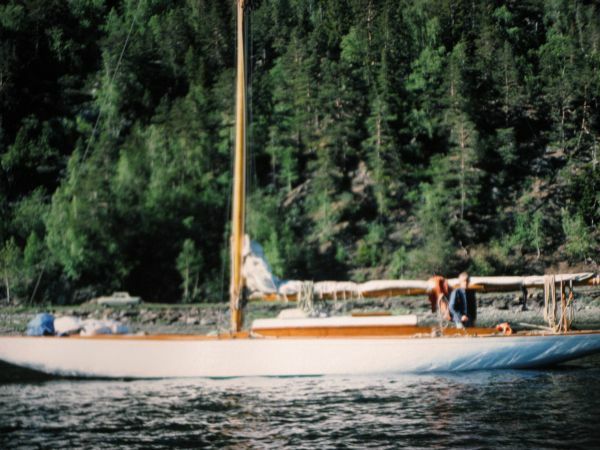 As such "Snarken" was in 1960 rigged with the mast and sails from "Lucie IV" . 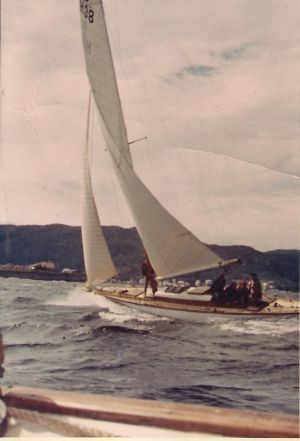 When 8mR "Sarina" after several years onshore at Kyrksæterøra, again entered the water in the early 1960ties she in understanding with my father was rigged with the original mast from "Snarken". the same summer he acquired sH38 “Snarken”. 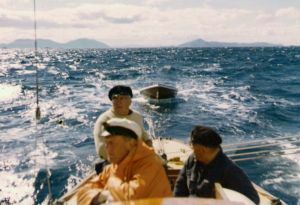 Racing crew; Odd Östlund, Egil Midtgaard, Öyvind Mylius and Ulf Faye Schöll, Kragerö. 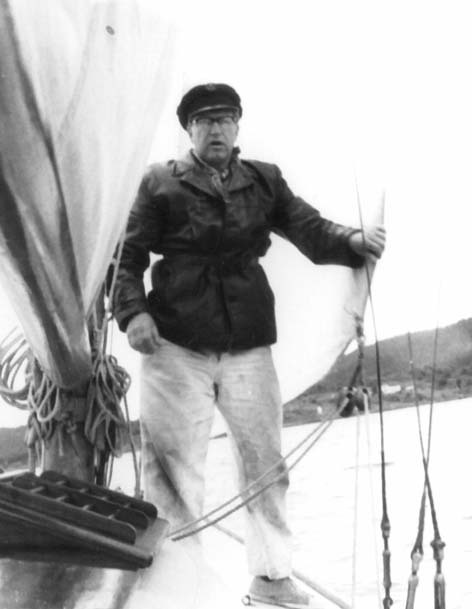 Picture taken onboard "Snarken" in the Trondheims fjord early 1960-ties. "Snarken” launched in Ilsvika, Trondheim, getting ready for a new season. crossing “Strindfjorden” bound for Trondheim harbour. returning to home port Trondheim from race week in Molde. 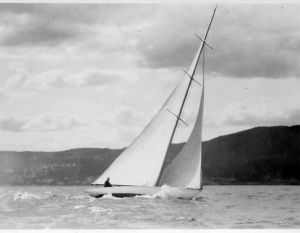 The Julius Loennechen cup was raced for in over a period of 47 years in Mid Norway starting 1918. 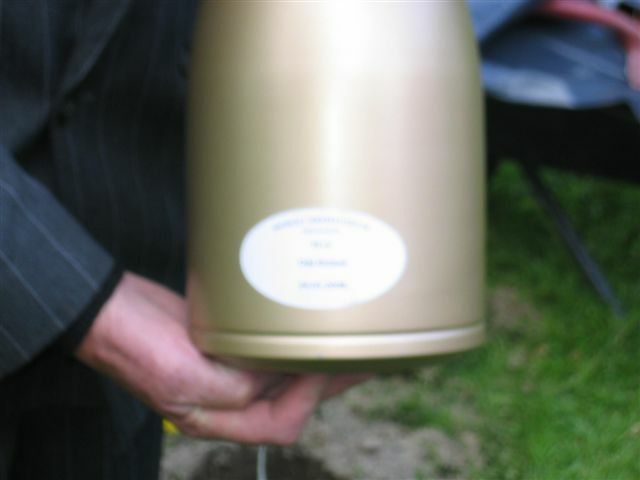 Odd Östlund finally won the Cup in 1965 with sH38 “Snarken”. 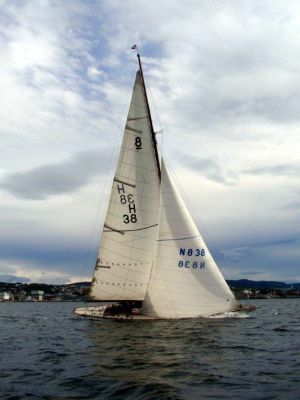 Main contender that year was sH28 “Njord”, first name “Baus” designed by Johan Anker in 1917 and constructed by Anker & Jensen 1918. Odd Östlund had previously won the Loennechen Cup in 1947 and 1948 with 8mR(old) H19 "Lucie IV" taken over from his father late Ole Östlund. During WWII "Lucie IV" had been pulled 200 m up from the shore into the field and placed under cover aside a barn at Smaaland in the Trondheimsfjord. 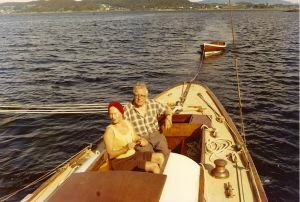 While many other yachts in Trondheim lost their bled keels to the Germans, "Lucie IV" kept hers. After the war racing picked up again. 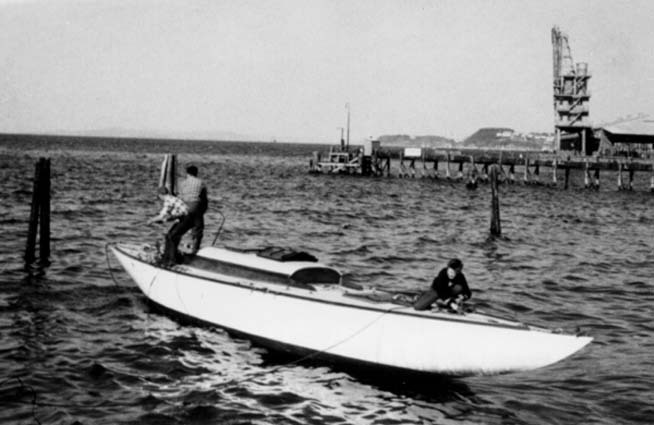 In the late 1930-ties Odd Östlund while he was working at the Navy yard in Horten had glued up a lightweight (min 145 kg) hollow spar for "Lucie IV". 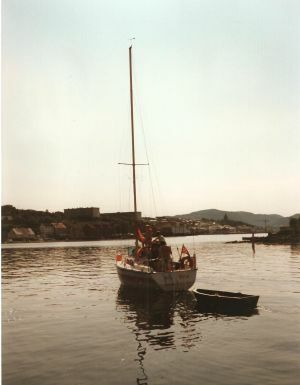 Standing at the slipway, masted, and ready for going to 1948 raceweek in Aalesund "Lucie IV" during launching overturned and her hollow mast broke in three pieces. 8m "Ninni II" was not in good shape after the War and "Lucie IV" was offered to take over her solid wooden mast. 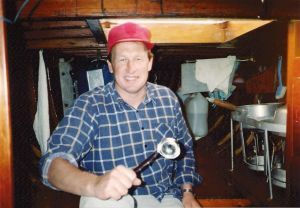 The same mast which today is onboard "Snarken". The top is lengthened and forward pointing spreaders mounted to stiffen the top. 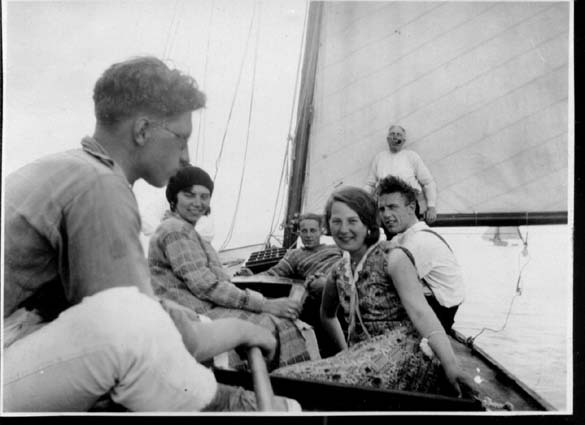 NFSU in Trondheim 1935: ”Plaisir”, H. Rohde-Hansen, Kristiansund N.
NFSU in Trondheim 1930: ”Doris”, Nilsen Hauge, Kristiansund N.
NFSU in Molde 1929: ”Selja”, Backer, Kristiansund N.
NFSU in Kristiansund N. 1927: ”Selja”, Harald Börseth, Kristiansund N.
NFSU in Kristiansund N. 1922: “Selja”, Harald Börseth, Kristiansund N.
In 1917 the Royal Norwegian Yachtclub (KNS) graciously presented to Trondhjems Seilforening (TSF) a Cup to be raced for in the 8mR Class. 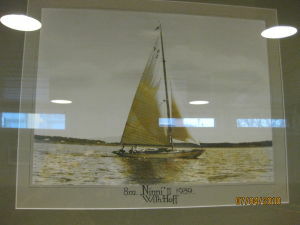 Winner in 1917 was 8mR “Taifun” with her new owner H.M.Hansen, Trondhjem, previous owner Wilhelm Hoff. In 1919 the winner was 8mR “Lucie IV” with owners Peder Jystad & Ole Östlund (my grandfather). 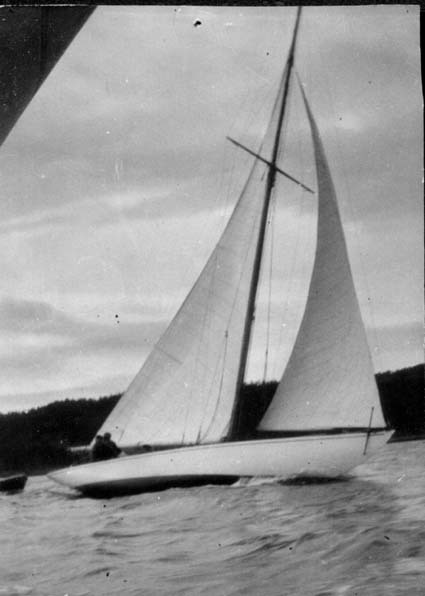 Ole Östlund and 8mR “Lucie IV” took home the cup with two more winnings in 1925 and in 1935. 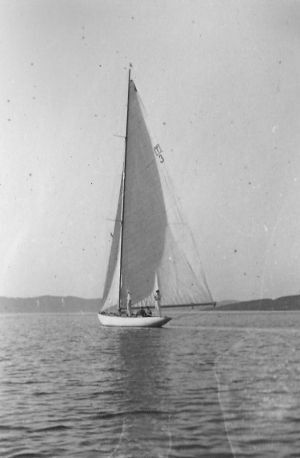 "Lucie IV" on the Trondheimsfjord around 1930. My father Odd Östlund at the helm and my grandfather Ole Östlund at the main boom. 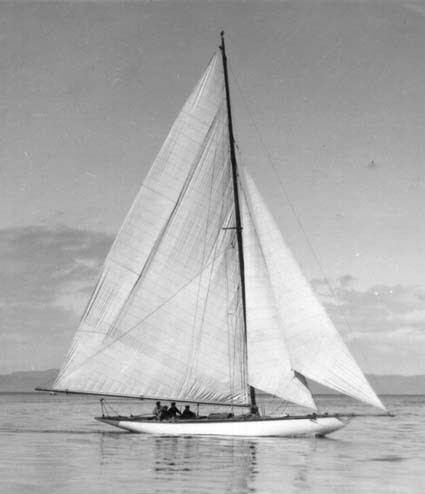 "Lucie IV" in 1925 with her Bermuda main sail. 8mR (old) "Lucie IV" ex "Magel" ex "Lucie IV"
Odd H. Östlund 23.07.1910 - 24.03.2008. 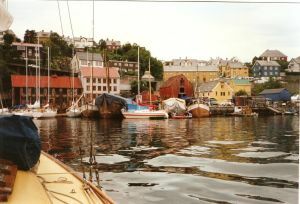 Trondheim harbour, Munkholmen at starboard. 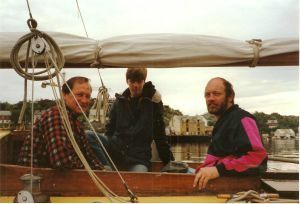 Odd Östlund at the helm and crew Arne Grönning (left) and Anders Gelein. Behind the camera, Roar Hoff. 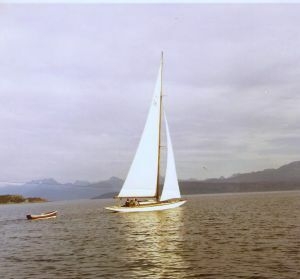 "Snarken" on the Trondheimsfjord during the 1970-80ties. 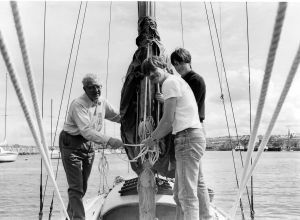 In 1983 my father age 73 set sail for 8mR WC at Hankø. 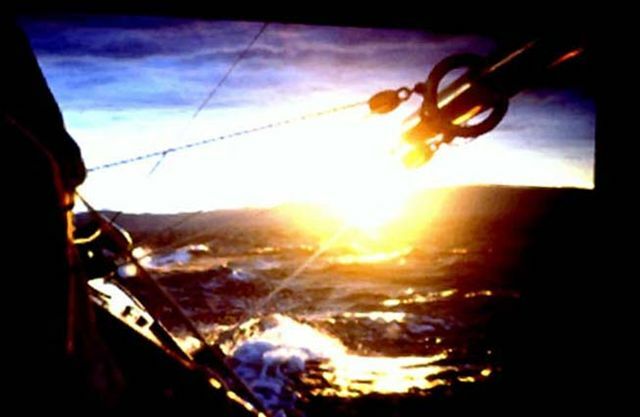 With two youngsters onboard he made the journey from Trondheim around southern part of Norway to Hankö in 19 days. Go to LINKS: "Snarken" to 8mR WC Hankö 1983 (in Norwegian). 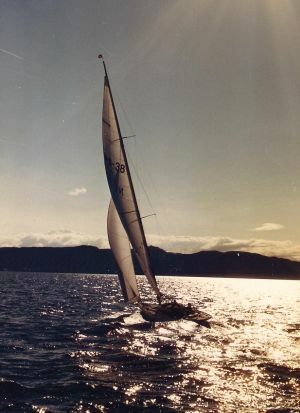 for NFSU (Mid Norway Race week) 1989. From left; Me, Haavard & Hans Gikling. 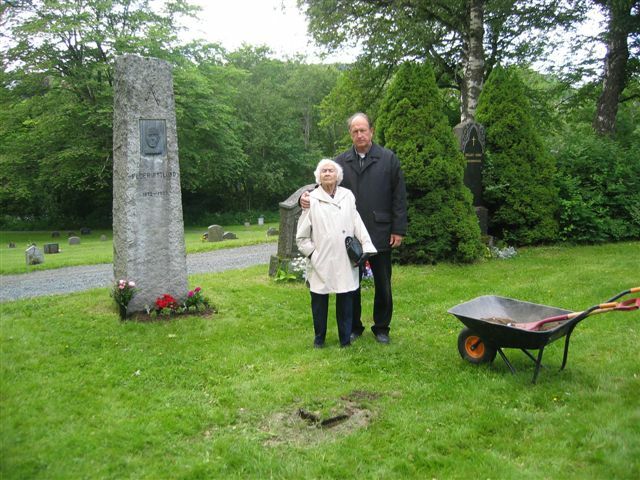 From left; Mrs Gikling, my father & Anders Gikling. "ROA" leaving Kristiansund after races. 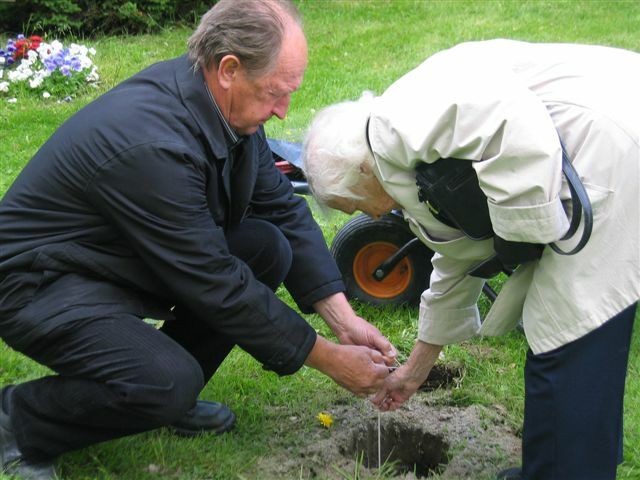 my father Odd H. Östlund started his journey with St. Peter to his last safe haven. "You will always be with us !"